Angie, the lioness that tried to eat the baby at Cheyenne Mountain Zoo, is stealing my mojo. 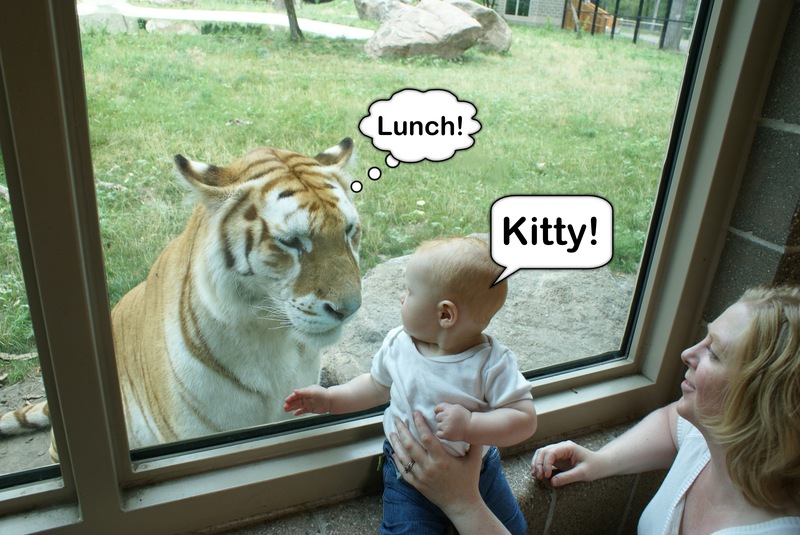 Ramu, the The Dakota Zoo’s Golden Tabby Tiger, tried to eat our son in 2009, two years before the “incident” in Colorado Springs. Carter wasn’t even a year old and couldn’t walk yet. Easy pickings. OK, so Ramu didn’t “try” to eat him, but he wanted to. Photos do not lie. I’m pretty sure I have video proof, too. If I can just find where I put the tape. So, Trent, I salute you and your parents. The video is hilarious. But the VandeVenters will not be out done. Our zoo opens back up July 1 (stupid flood), and I think Carter needs to visit the grizzly bears. Haha I love this picture! And a video of the bears has youtube viral written all over it. Put me down for about 100 views. Lions do find babies tasty! Thanks for posting this.